I'm subscribed to Flickr's RSS feed for photos tagged tacoma, so I can see if there's any neat photos of places around town. 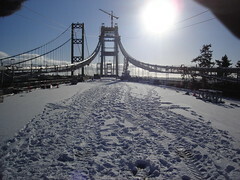 Today there were a few of views from new, under construction Tacoma Narrows Bridge. Turns out WSDOT has a Flickr account and has posted some interesting photos up there. Having just bought the Nike+ Sport Kit and 4GB Silver Nano, I didn't really want to drop another $100 or so on new shoes. Thus, I got out a Swiss Army knife and did some reconstructive surgery on my old Adidas running shoes. Remove the insole from the left shoe. 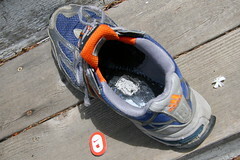 Use a sharp object to dig a hole of the right size in the approximate middle of the shoe. Periodically try to fit the sensor into the hole, so you can get it to just the right size.